The LOS ANGELES RIVER runs 52 miles through some different communities in the region, from Canoga Park in the San Fernando Valley through downtown to the ocean in Long Beach. It’s one of the most environmentally degraded river in the world and today it flows through a concrete channel on a fixed course to the ocean , against all the natural laws of a river. Today is one of the world’s largest storm drains. The LA RIVER, with its rich and diverse ecosystem, was a very crucial part in the historic development of Los Angeles and it’s a landmark resource, even if it is estimated by the City of Los Angeles that many natural riparian ecosystems and of natural wetlands have been lost through the urbanization of the LA RIVER. 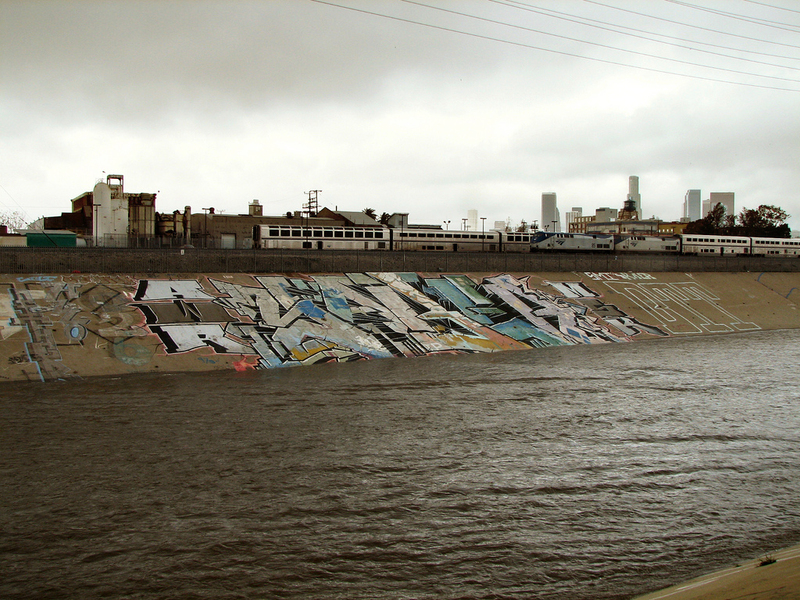 The LOS ANGELES RIVER REVITALIZATION MASTER PLAN of the City of Los Angeles consists of 239 projects, most of them small, but someone, however, would be great. 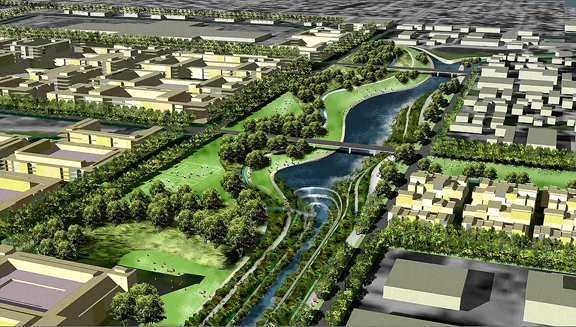 In two places , Chinatown and Canoga Park ,residential and office villages would rise along the river’s newly greened banks, replacing factories and warehouses. 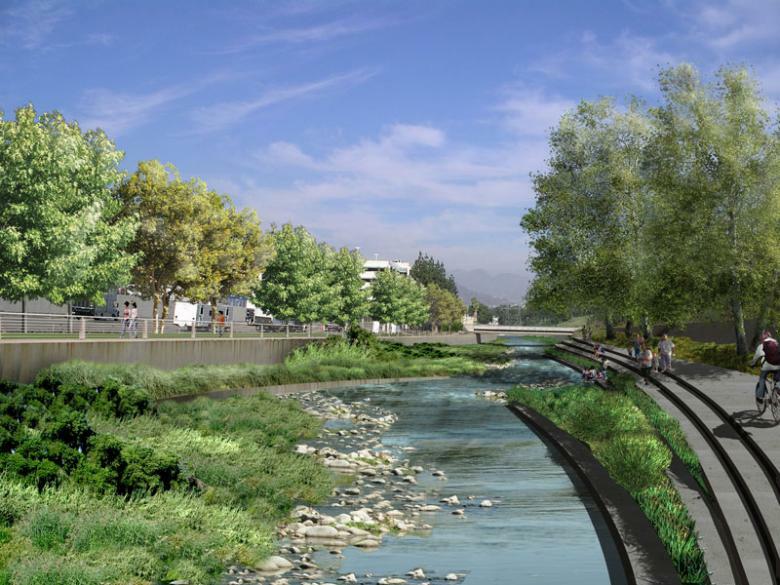 The Los Angeles River Revitalization Master Plan would incorporate bike paths , urban parks and new green ways along the banks of the LA RIVER but keep the river partially cemented for flood control.Anyway some environmentalist groups propose the removal of concrete and the restoration of natural vegetation. Restoring the river to its natural habitat would be too expensive, complicated and utopian too, especially in a time where our economy is struggling and where there are not enough economic resources . However, most of the money has not been secured and the Revitalization Master Plan could be a challenge. Surely it’s an important chance to redefine the Los Angeles River as a civic space to reconnect residents to their natural landscape and its history. Onether potential problem with the Revitalization Plan is the fact that one aim is to create value in some of the poorest neighborhoods that border the LA RIVER. From Downtown LA, through Boyle Heights and Compton these neighborhoods have some of the highest unemployment rates in the nation at an average of 20%. The Master Plan argues that by creating aesthetically and recreationally valuable land along the river, homes values will go up increasing the economic status of some of the poorest neighborhoods. Usually it’s doesn’t work and the new projects could increase the rent prices and push the poor out. That is now called gentrification and it’s a risk that it’s better to avoid. It’s vital to consider the effects this Plan is going to have on the people who have already established themselves in the area. This entry was posted in Los Angeles noir and tagged LA river, Los Angeles, Revitalization Plan. Bookmark the permalink. It’s really a cool and helpful piece of info. I am happy that you simply shared this useful information with us. Please stay us informed like this. Thanks for sharing. I hope so!I’m happy to share my passion with other people interested to Architecture. Every single day we have to handle with Architecture…the city is our natural landscape, so it’s better to think about it. Bye! Usually I do not learn post on blogs, however I wish to say that this write-up very pressured me to take a look at and do it! Your writing taste has been surprised me. Thank you, quite nice article.